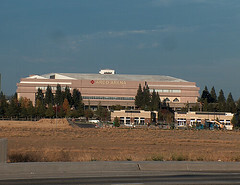 The city’s groundbreaking new idea for financing a replacement for Arco Arena is to charge fans for their attendance, as this Sac Bee article explains. I’m kidding, though I’m not quite sure how $40,000 over 40 years, paid as $1000 per year ($24 per game) is different than a $24 season ticket (and $24 at the current Arco location basically gets you a parking space). If it had to be paid upfront I could understand. Previous Previous post: The Creative Use of Coincidence? Next Next post: Our name is Sacramento, and we have a problem.